Food Colouring – A Guide – Create, Make & Bake! 26th October 2017 12th February 2018 - by Lydia - 7 Comments. I was brought up with one option if you wanted a cake or icing a different colour, liquid colourings. These worked fine if you wanted a pastel colour but if you needed a really vivid red or (the worst ever) black icing, forget it. You had to put so much it to get the desired colour that you ended up with a horrible aftertaste. And, using half a bottle wasn’t very cost effective either. This is what you will find in most supermarkets, cheap and in a variety of colours. As I said above, perfect for a pastel colour, put a couple of drops in and you are done. As the liquid colours are water based they can ‘thin out’ a recipe which can cause problems. These are available in small pots or squeezable tubes and are more concentrated than the liquid colours. This means you use very little to get a more vivid colour so it won’t affect the recipe or taste. These are jars of dry powder, so are perfect when additional liquids may cause a problem with your recipe. They can be used to add colour to fondant icing and are also used to add colour to cake toppers. Being dry these have a very long shelf life. Useful for personalising cakes with a hand written message or for adding details to cake toppings, eye’s are so easy with these. You can now buy professional chocolate colouring which comes in the form of coloured coco butter that you mix into warmed chocolate. Most people making things at home would choose chocolate colourings in bright pure powder pigments. These are mainly used to colour white chocolate. You can also colour white candy melts with these which tend to be used when making cake pops. I’m only scratching the surface here as there are so many options available these days. I will add links to recipes that have used colourings as we make them. I try my hand in baking from time to time and I had no idea of all the different types of food coloring. This is good to know for future projects! There’s so many options! Love edible markers. It’s so fun to draw little flowers or animals onto cookies and cakes! Yep, I agree. I really like them and I will be posting more recipes including them soon! I personally prefer to use natural coloring. The colors are not so bright, but I feel a lot better knowing, that I didn’t use anything artificial. I totally agree with you Vera. I much prefer natural colours but as the children are making most of the recipes at the moment it’s easier for them. We will be using more natural ones as they get older. 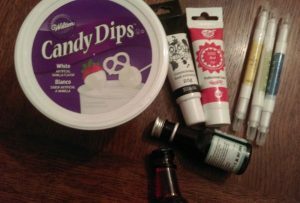 I’ve been wanting to venture into a few baking projects and glad I ran into your post. Thanks for the info! Your’re welcome, hope you find something you like!